Identify correct article (out of four) by scent. Dog correctly indicates the handler’s scent (or nosework scent) from among four objects. Purpose: Scent discrimination allows a dog to express one of its most natural talents — using his/her nose! Equipment: Four items — they may be identical or different. Nosework (NW) scent oils optional. The scented object cannot contain food. Exercise set-up: Handler places three non-scented items on the ground approximately 8 inches (20 cm) apart — the dog may watch this process. Handler scents the object by holding it in his/her hands for about 10 seconds OR adds the NW scented object via a tin or another safe container. If NW scent (oil) is used, the article may be prepared before the start of the exercise. The scented object is first held up to the camera and then is added to the collection so that it is obvious to the judge which one is correct. 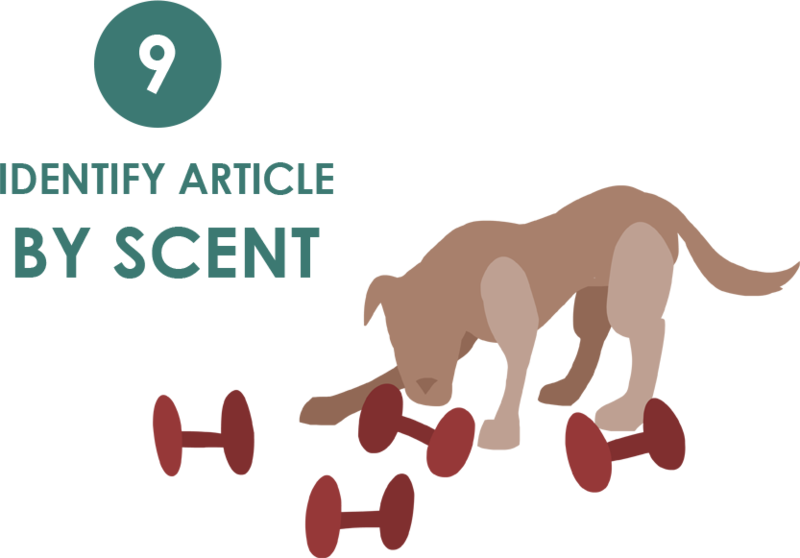 If the dog watches the article placement, then the dog is then sent around a cone a short distance from the collection, or chases a thrown cookie, and on the return is allowed to work the scent articles. Alternatively, the dog may be placed 6 feet from the pile with the handler blocking the view of the article placement. The exercise begins when the dog is cued to find the article as he/she is returning from the cookie toss or cone or when the dog approaches the pile on his/her own. Once the dog is cued to search, the handler may not move until the dog finds (retrieves or indicates) the correct object, at which point the exercise ends. The handler may sit or stand next to the collection. Non-qualifiers: Judge is unable to identify the correct article based on the dog’s behavior. Judge is not sure which is the scented article based on handler’s movement, object placement or angle of video. Dog does not approach the articles when directed. Dog does not search the pile. Dog indicates/retrieves an incorrect article. Handler talks or moves during the exercise, or gives multiple cues. Dog requires multiple cues to continue working. Video does not permit the exercise to be adequately judged. The judge MUST be able to identify the correct article — do this exercise close to the camera and clearly indicate the correct article. Feel free to sit next to the articles. Remember that the exercise ends when the dog indicates the correct object. You do not need a formal front unless you want one.